January 17, 2014 | Comments Off on Golf – who knew? 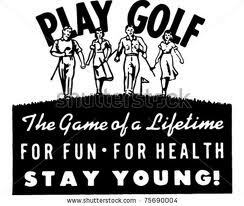 It could be that time of life, the time when one takes up golf. 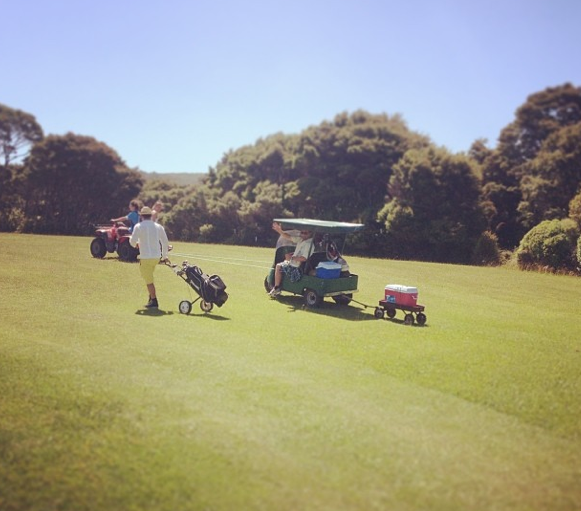 Our friend has an annual golf tournament on Great Barrier Island for his birthday which is always hilarious. (This year, as he had hurt his foot, and Luke’s vintage homemade golf cart invention was typically not quite ready, there was a towing the golf cart arrangement featuring a farm bike – see pic). Anyway, I usually opt out of golf because of lack of skill e.g. This year I hit one ball and after about ten attempts which just resulted in that whooshing air sound, I retreated to the support crew. But the following day, I snuck back onto the course and did 9 holes with Luke, and you know what, I actually loved it. I only did it as I have this bloody blog to write where I have to try something new if possible. Using an old set of clubs that I admit we actually found on the side of the road during an inorganic rubbish collection a few years back (and it transpired that they once belonged to our neighbor’s elderly mother and they had chucked them out), I found with a bit of positive encouragement I managed to get around the course and loved it. So this could be my new thing. I like the sort of retro edge to it all and if we can get the golf cart working and a pair of plaid trousers, then maybe……. A small story on my history re golf. Years ago when I was applying for a job in a London advertising agency, I lied on my cv and put down “golf” under hobbies and interests to make myself appear a more sporty, all rounder type. I got the job on the spot as the big cheese was a golf fanatic and the day I started the job, I found he had readily signed me up for the Client Golf Day occurring the following week. Yikes. What was a girl to do? I had to tell him, on my first day, that I was in fact a barefaced liar having never really played golf, explaining that I was just trying to look more interesting and sporty. I think my quick fessing up made an impact as I am delighted to say that he is still a very good friend whom I had the pleasure of dining with on my recent trip to London.